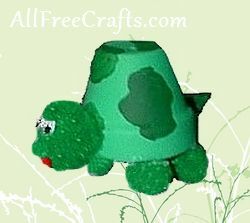 Turn a terra cotta clay pot into a cute turtle with pompom feet. 1. Paint a small terracotta plant pot completely, inside and out, in the lighter shade of green acrylic paint. Let the paint dry. 2. Paint darker green splotches randomly on the pot, to represent the shading on a turtle shell. 2. Glue the four small green pom poms to the rim of the terra cotta pot as feet. Let the glue dry. 3. 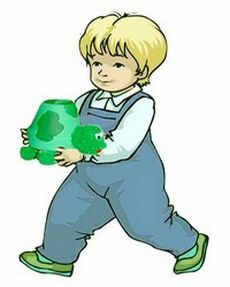 Glue the medium green pompom to the outside rim of the terra cotta pot, to make the turtle’s head. 4. Glue the two tiny goggle eyes into place on the medium pom pom head. 5. Cut a tiny oval of red felt for the tongue and glue it to the head (see photo for details). 6. Cut a tiny green triangle for the tail and glue this to the back of the terra cotta pot. 7. Say hello to Timmy the Turtle TerraCotta Pot!